When a household has an item it no longer needs there tend to be four options – bin it, sell it, give it away or put it in storage. Heading for the nearest landfill site is not exactly environmentally friendly, especially if the item is in working order, and there is only so much any household can put in to storage. Giving things away, be it to charity, friends or for recycling, is commendable, but when money is tight it might be better to boost the household coffers. The way second-hand household items are sold has changed due to the growth of the internet. There are numerous online marketplaces that allow people to sell items they no longer want or need and eBay is the most popular of these. While an advertisement in the local newsagent’s window may be seen by 100 potential buyers and an ad in the local newspaper may be read by 1,000 potential customers, eBay’s UK website – launched in 1999 – now has over 14 million active users. 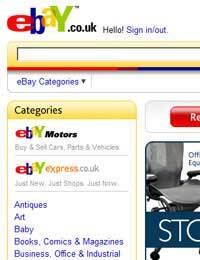 With more than 10 million items for sale on the site at any one time and more than 13,000 different categories, it’s possible to sell just about anything on eBay UK. There is even access to overseas customers, with a global customer base of 233 million. Anyone with a computer and internet access can tap into this marketplace and sell their unwanted things. First set up an eBay seller’s account, which includes your contact information and email address, and then create a PayPal account. PayPal is a secure way to accept credit card or bank account payments and is the preferred method of payment for the vast majority of buyers. Each item to be sold has to be listed on the website. It is best to include a photograph of what is for sale, as buyers like to see the condition of the items. Try to ensure photographs are sharp and bright and that there is not too much clutter in the background. Choose the most appropriate category to sell the item in, as this will help buyers find your item among the millions on offer. Perhaps most importantly, give the listing a title that is clear, complete, and descriptive. Many buyers will search for keywords to find what they want, so describe the item exactly in the title and include brand or product names. The listing will also offer a chance to give a more detailed description of the item and its condition. Be realistic when pricing items. Take age and condition into account and remember that there is a lot of competition from rival sellers out there. There are different ways to sell on eBay. An item can be given a fixed price or sellers can set a starting price and let buyers bid for the item like at auction. These sales can last between three and 10 days. If a seller is not willing to let an item go too cheaply, he can set a reserve price that bidders must reach to seal the deal. If the seller is willing to post the item for sale throughout the UK or abroad, he must decide which postal service to use, calculate what it will cost, including packaging, and include the price in the listing. Larger items can be sold on a collection-only basis. Remember too that eBay and PayPal fees will eat in to any profits. Once listed, items can be tracked to see how many buyers have shown an interest or placed a bid. Don’t panic if an auction item is struggling to attract bids, as many buyers leave it late in an attempt to get the best deal. Once sold, an item should be packaged and posted promptly. Tell the buyer when the item was sent and when he can expect to receive it. Once the buyer has received the item, he has the option to rate the seller with feedback that can be viewed by all future potential customers. It pays to maintaining buyer satisfaction, therefore, as this can help build a solid reputation as a trustworthy seller and so drive sales.